It might not turn out to be the summer of love but I’m sure it will be trucking good one. My good buddy Mat Ireland is once again going to have a busy summer keeping all of our favourite music artists, moving about Europe, keeping us all entertained and giving us those summer songs and experiences we all crave during the long dark months of winter. Mat has promised me that he will keep the video diaries coming this year, so I thought it was only fair to post his first video for you all to see. I don’t need to say anything about it other than it seems a long way down down to the bottom deck of the Stena boat! I’ve been aboard many times but I have never been down to the bottom. Anyway it’s a cracking start to the season Mat, so please keep them coming……sorry about the plonker you met in Colchester on your way to Harwich. Would you like to spread the news that KINGS HEAVY HAULAGE have had a TV series made about them and the first program goes out this Friday at 9pm on Quest? KINGS HEAVY HAULAGE – WE’RE GONNA BE ON THE TELLY !! On Friday 20th February you see the team here at Kings starring in our very own reality television series – SUPERTRUCKERS. Kings Heavy Haulage are here to show you just how they earned the name ‘Supertruckers’ in this brand new Quest series. In each of the episodes the team are confronted with challenges of logistics and logic as they negotiate weird and wonderful objects around the familiar settings of the motorways of Britain. SUPERTRUCKERS premieres every Friday at 9pm from 20th February. For the team at Kings Heavy Haulage, no job is ever too big as the 25 strong team haul awkward, colossal and abnormal loads up and down the country.The six-part observational documentary follows Bristol-based, family run business, Kings Heavy Haulage as the truckers test themselves both physically and mentally in their quest to deliver difficult loads. The series is brought to life with the lively characters who are some of the most experienced truckers in the business. Kings Heavy Haulage, Loads Safer! Volvo Trucks marketing have done it again!! A super bit of Swedish marketing along with the one of the best drivers in the UK, Mr Tiff Needell. This time Tiff is taking an FH 540 around a Swedish race track and having rather a lot of fun in the process. The only thing about the video is that lucky Tiff gets to drive the big Volvo in a derestricted state, something that all (most!?) drivers can only dream about these days. Have a little read of the press release below. The idea behind the crazy Needell-ness is to promote Volvo truck’s new dual clutch gearbox, it does look very smooth!! 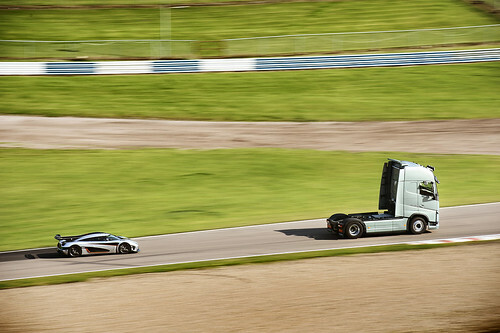 An eight-tonne Volvo FH against one of the world’s fastest cars – a Koenigsegg One:1. This is the scenario in Volvo’s new YouTube film, ‘Volvo Trucks v Koenigsegg’. The aim is to put the new I-Shift Dual Clutch gearbox – based on a technique used in sports cars – to the ultimate test. In the film a Volvo FH comes up against a Koenigsegg One:1, with as much horsepower as weight kilos (1360), making it the world’s first mega-car. In order to stand a fair chance, the Koenigsegg received a handicap which means that it drove two laps of the Knutstorp race track in southern Sweden, whereas the Volvo FH tractor unit only drove one lap. Despite this, the conclusion is still unpredictable. The purpose of the race is to put the new Volvo I-Shift Dual Clutch gearbox to the ultimate test. “I-Shift Dual Clutch has a dual-clutch, which is quite unique in the heavy vehicles market. However, similar technology is already in sports cars. Therefore, this was the perfect challenge,” said Jeff Bird, Press Test Director at Volvo Trucks. The similarities between the Volvo FH truck with I-Shift Dual Clutch and sports cars include includes a driveability that comes with seamless gear shifting and this is no more evident than at this circuit, which is known for its hilly terrain and demanding turns. “It may sound like a different environment for a heavy truck, but the fact is that – thanks to its dual-clutch – I-Shift Dual Clutch is most useful in conditions that require a lot of shifting. The gearbox’s seamless shifts improve driveability tremendously,” said Jeff Bird. Behind the steering wheel of the Volvo FH is the experienced motor racing personality Tiff Needell. Without revealing the results, Tiff – who had never raced in a truck before – admits that he was impressed by the performance of the vehicle. “I-Shift Dual Clutch is absolutely incredible. It is particularly noticeable on slopes, the truck does not hold back – it just flows smoothly, without the gear changes being felt. When you brake, it switches down very softly and comfortably. The truck definitely has the heart of a sports car,” says Tiff Needell. Volvo Trucks’ new dual-clutch gearbox was launched in Europe last June and is available on Volvo FH with Euro-6 D13 engines at 460hp, 500hp and 540hp ratings. Once again Volvo Trucks have pulled out all the stops, to show the world just how good the new technology in the new truck range is. Before we had the tight rope between the trucks and the bull run to name a few, but this time it’s a well know actor doing the splits on the wing mirrors of two reversing Volvo FM’s. How they got JCVD to be involved is anyone’s guess but you have to admit that these stunts by Volvo are becoming pretty impressive. The video above is pre-stunt build up, while the video below is the stunt in full……..I’m not sure if JCVD is an optional extra on your new Volvo but I’m guessing he’ll be pretty split between you and the next customer anyway! Volvo Trucks Youtube channel is HERE. In Volvo Trucks’ series of spectacular tests, the turn has now come to the Volvo FL distribution truck. During the development of the new Volvo FL, top priority was given to making the vehicle as comfortable as possible to drive. 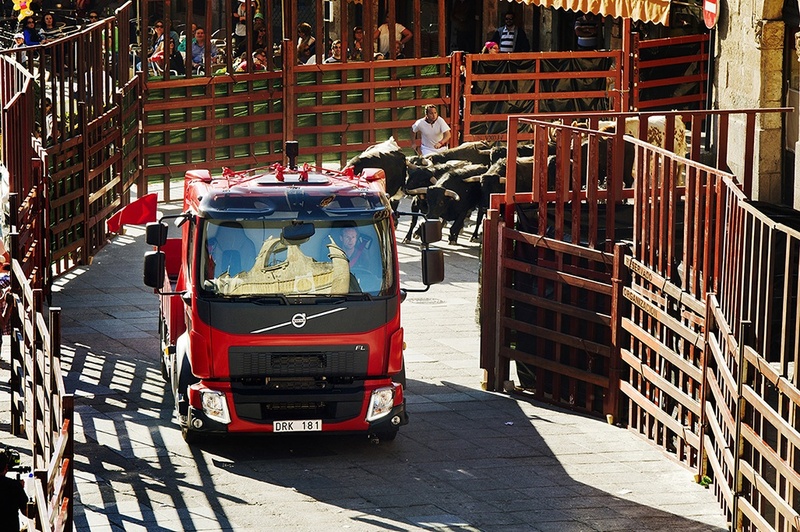 In ‘The Chase’ Volvo Trucks aimed to show how easy it is to manoeuvre the new 12-tonne truck in a demanding urban environment by giving precision driver Rob Hunt the task of driving a two kilometre course through the congested streets of Ciudad Rodrigo, near Salamanca – while being chased by a herd of bulls. “The town is old, the streets are narrow and we drive on slippery cobblestones. To be chased by bulls on top of that is a real challenge,” says Rob Hunt. During the test in Ciudad Rodrigo, the truck had to maintain a speed of at least 30 kilometres an hour just to keep ahead of the bulls. In certain sections of the course the streets were so narrow that Rob Hunt had to tuck in his rear-view mirrors. “The bulls maintained a consistently high speed and were really close sometimes, but the truck handled the corners very well so it was just a matter of driving. There was a whole lot happening, but the truck helped me the whole way,” says Rob Hunt. The safety of both people and animals was the top priority during the spectacular event and all necessary safety precautions were taken. “The biggest risk was that we were in a town. It was live and we had to make sure that it was safe for both people and animals. With the big rear mirrors I had a good view of the bulls and the bull runners behind me so I could keep a good safe distance. And the automated gearbox made it easy to focus on the driving,” says Rob Hunt. “The new 12-tonner is a sharp contender in the largest medium-duty distribution segment. The truck is well-thought-out in every detail. Take for instance the smaller wheels, which lower the cab by five centimetres. This gives the driver better visibility all round and makes it easier to get in and out of the cab,” says Tobias Bergman, Product Manager Distribution and Refuse Segment at Volvo Trucks. The fact that the Volvo FL is specially tailored for fast and agile urban transport was something that precision driver Rob Hunt learned first-hand when he took the starring role in ‘The Chase’. “For a driver using this truck every day for work its comfortable, for both short-distance and longer trips. It has an automated gearbox and cruise control and it’s easy to steer. The visibility is great; you can see cars, bicycles and pedestrians. This truck definitely makes the driver’s life easier,” says Rob Hunt. Above is the behind the scenes, making of the video. It doesn’t matter what angle you look at it from, it is another top marketing ploy by Volvo Trucks, after all people like me are busy writing about it for you to read! Volvo Trucks Youtube channel is HERE. For the animal lovers among you Volvo have stated that none of the bulls were hurt during filming and after filming the bulls were retired to a farm in Guadalajara.